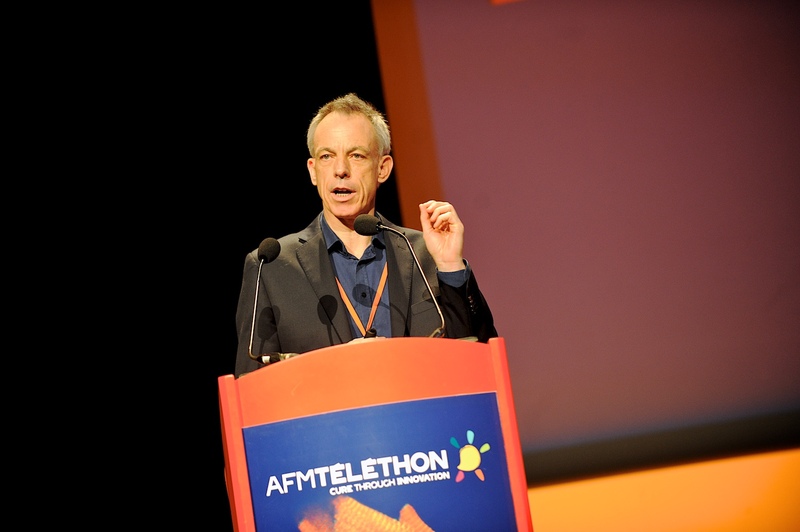 AFM-Telethon / News / Follow all the news from Myology 2016 ! Home>News>Follow all the news from Myology 2016 ! Follow all the news from Myology 2016 ! 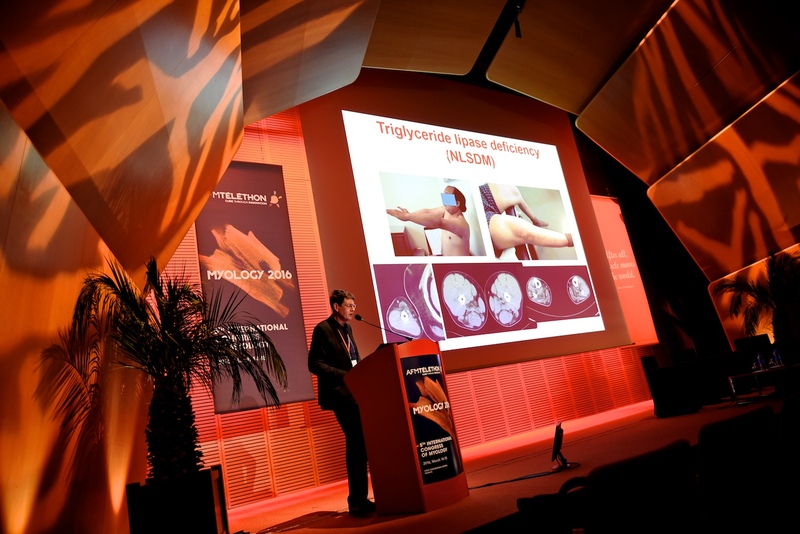 Throughout the week, follow the news from Myology 2016 on this page ! The congress Myology 2016, organised by AFM-Téléthon, is now coming to an end: over 900 international experts in the field (researchers, clinicians, doctors…) have compared their latest work for 5 days. This edition was undoubtedly marked by the beginning of the therapeutic era for neuromuscular diseases with the presentation of clinical trials results in human and the first lessons learnt from those trials. Now again, we’ve witnessed presentations on the advances and the projects of gene and cell therapies for the heart, whether for cardiomyopathies or post-infarction heart failure. Therefore, P. Menasché (HEGP, Paris), leading the 1st French trial using embryonic stem cells for heart attack victims, spoke up. Drawing on his experience (4 patients now treated), he outlined the future development of this cell therapy approach, underlining the importance of trophic factors brought by the transplanted cells over the cells themselves. Lucie Carrier from Hamburg presented her work on mice for a gene therapy of genetic cardiomyopathy. For her part, Hélène Puccio (Illkirch) showed that gene therapy of cardiomyopathy in Friedreich’s ataxia works for mice, even in post-symptomatic cases. The vector used (AAV10-FXN) is being developed by the company Anapurna for a trial in human. This 5th edition of the AFM-Téléthon congress was also the occasion for the young researchers financed by the Association to show their works to the international scientific community. 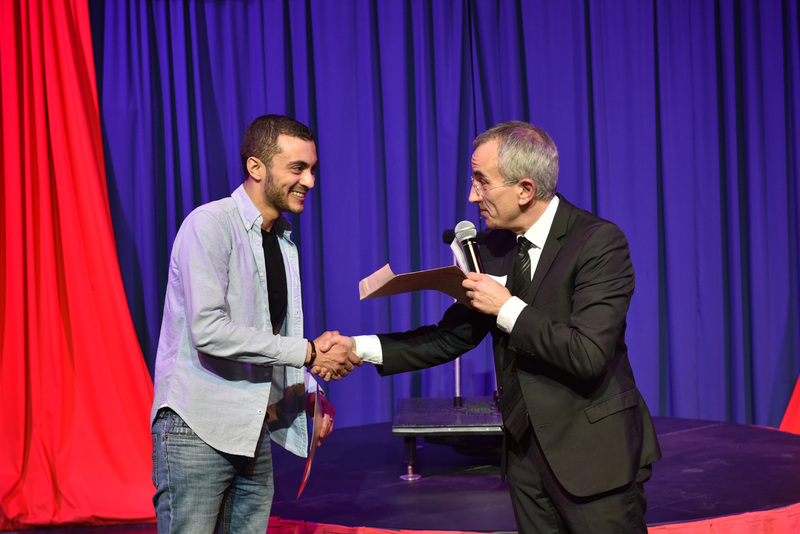 Two of them received a prize for their oral presentation: Muriel Sébastien (Institute of neurosciences, Grenoble) and Pierre Klein (Institute of Myology, Paris). Watch the summary of Day 5 at Myology 2016! Focus Researcher: Charles Gersbach on the use of gene correction and gene editing technologies to correct mutations in genetic diseases. The fourth day of Myology 2016, organised by AFM-Téléthon, opened on a plenary session dedicated to the different myology-related advances. H. Lee Sweeney from the University of Florida (USA), co-chairman of the congress, overviewed the trials using oligonucleotides in Duchenne muscular dystrophy. He underlined the need, for demonstrating the efficiency of products currently under clinical researches, to improve the homogeneity of included patients, the selection of evaluation criteria, as well as the tools and the biomarkers used. Throughout this session, Ana Buj-Bello from Genethon (Evry, France) presented her work on gene therapy for X-linked myotubular myopathy (XLMTM) which have proved effective after only one injection in the dog model of the disease, followed by a quick and long-termed recovery (3-year hindsight), also when the disease is established. During the afternoon session, called “SMA and therapeutics”, Richard Finkel from Philadelphia (USA) and Jerry Mendell from Colombus (USA) presented the results of ongoing trials in spinal muscular atrophy type 1 (SMA1), the most severe form of the disease, involving a vital prognosis of under 2 years. Two therapeutic strategies are being tested: an antisense oligonucleotide product by Ionis Pharmaceutical and a gene therapy product from Avexis. The two American researchers showed outstanding videos of motor skills acquired by the treated babies: tonus, head holding, sitting position, standing position… Those preliminary results require to be confirmed, but mark the arrival of advanced therapies for spinal muscular atrophy. Watch the summary of Day 4 at Myology 2016! Focus Researcher: Jerry Mendell told us about gene therapy in spinal muscular atrophy. Focus Researcher: H. Lee Sweeney discusses the difficulty of having drugs approved for Duchenne muscular dystrophy. Focus Researcher: Ichizo Nishino on his research for Nonaka myopathy (GNE). Wednesday opened on a symposium based on the development of innovative therapies, which make a new, booming type of medicine. Because the first drug candidates developed so far are only “prototypes”, researchers and doctors are building a strategy to tackle the disease on all fronts. Matthew Wood from Oxford University (UK) restored the expression of dystrophy of mdx mice thanks to a new generation of peptides improving exon skipping and allowing a more efficient targeting of a wide number of tissues in the organism, such as the heart or the central nervous system… Aurélie Goyenvalle from the University of Versailles Saint-Quentin also developed a pharmacogenomics approach using a new antisens oligonucleotide which was successfully tested on mice. Caroline Le Guiner from Atlantic Gene Therapies (Nantes) presented the results of her work on gene therapy on GRMD dogs, a Duchenne muscular dystrophy model. Two different treatments based on the use of AAV vectors are being developed. During the parallel symposium “Myotonic dystrophy”, Bernard Jasmin from the University of Ottawa (Canada) presented his works to identify binding proteins playing a key role within the skeletal muscle, especially Staufen1 binding protein. Studies show that Staufen1, which mounts up at the level of the neuromuscular junction’s post-synaptic membrane, is a key protein influencing on numerous muscle processes. It may play a key role for Steinert myotonic dystrophy or DM1, one of the most common forms of hereditary neuromuscular diseases in adults. During the same session, Denis Furling from the Institute of Myology (Paris) also dealt with Steinert myotonic dystrophy. This dominant autosomal disease is caused by abnormal repetitions of trinucleotides in the responsible gene. The length of the extension is usually correlated to the disease’s clinical severity and its onset age. Several therapeutic strategies are being developed to neutralise the NRA toxicity in cells, especially thanks to the use of a polypeptide. This strategy enabled correcting myotonia in mice. During the afternoon plenary session, called “pharmacotherapy”, the participants presented several potential pharmacologic treatments for various neuromuscular diseases (Duchenne muscular dystrophy, Nonaka myopathy, oculopharyngeal muscular dystrophy, selenopathy): repositioning of molecules used in other fields or of new molecules. Watch the summary of day 3 at Myology 2016! Focus Researcher: Bernard Jasmin (University of Ottawa) discusses the factors enabling the modification of myotonic dystrophy. Focus Researcher: Guillaume Bassez (AP-HP Henri Mondor) talks about the results of his researches. This second day started with a lecture by Christophe Marcelle, initially in charge of the Australian Regenerative Medicine Institute at the University Monash in Melbourne, which has carried out the project Muscle formation, growth and repair since 2009. This project allows the understanding of cellular and molecular mechanisms, which regulates differentiation and myogenic repair. He is now carrying out this project among NeuroMyoGène, a new institute based in Lyon and whose goal is to establish a centre of excellence on neuromuscular diseases in the Auvergne-Rhône-Alpes area. During his speech, he especially discussed how the future of the embryo cells can be influenced by various factors. These results emphasise a link between myogenesis and a change in cell adhesion in numerous developmental and disease processes. The following subjects were also mentioned throughout the day: mitochondrial dysfunctions, the functioning of neuromuscular junctions and the mechanism of some diseases, notably myasthenia (an autoimmune neuromuscular disease) or metabolic diseases. During the symposium called Metabolic Diseases, the muscle lipidic metabolism disorders were presented by Pascal Laforêt (Assistance Publique – Hôpitaux de Paris) from the Institute of Myology (Paris). These disorders are inborn errors of metabolism, which manifest themselves in adults as a progressive muscular weakness of the limbs or exercise intolerance with rigidity or induced muscular pain, often coming along with regular episodes of rhabdomyolysis (risk of acute renal failure). Even if they are rare, those diseases are now more and more known because of the increasing use of tandem mass spectrometry enabling to detect the accumulation of acylcarnitines in blood. The diagnosis is essential because some of these rare diseases can be treated or improved by a dietary plan or drugs. In type 2 glycogenesis, Pr. Ven der Ploeg (Netherlands) reviewed 18 years of enzyme replacement therapy for children and adults (over 700 patients treated in the world), generally involving a stabilisation for adults and an improved efficiency for children. The first child treated in 1999 is going to celebrate his 18th birthday, while this disease is fatal for newborns. Watch the summary of Day 2 at Myology 2016! Myology 2016, the 5th international congress of myology, organised by AFM-Téléthon, has started yesterday. Throughout this week, over 800 international experts on muscle and its diseases will gather at the Palais des Congrès in Lyon. This event will be the highlight of international myology in 2016, 30 years after the discovery of the gene involved in Duchenne muscular dystrophy, announced in 1986 at the Tours congress, also organized by the Association. The first day was marked by the opening lecture of the American researcher, Kenneth Fischbeck, one of the signatories of the publication concerning the discovery of the gene involved in Duchenne muscular dystrophy, the first gene discovered in the history of neuromuscular diseases. This identification, made possible thanks to an innovative method called reverse genetics, has been decisive for the whole scientific community. Myology has become the backbone of advanced therapies and is now an essential scientific field. “30 years ago, 400 researchers went to the symposium in Tours and it was a great success for our Association. Here in Lyon, in 2016, you are over 800 to exchange and discuss for 5 days. The international community of Myology has been extended, strengthened… it is the backbone of therapeutic innovation. Most of the communications of Myology 2016 will focus on innovative therapeutic pathways, on ongoing clinical trials involving hundreds of patients around the world, and even on the first drugs on their way to be authorised on the market. We have undoubtedly entered a new era! And the closer we get to our goal – Cure – the more complex and numerous are the challenges : treating the whole body, bioproduction of the advanced therapies at an industrial scale, obtaining the first authorisation of marketing for those advanced therapies… We are opening the way in numerous fields and the years to come will be decisive.” declared Laurence Tiennot-Herment, president of AFM-Téléthon, during the opening of Myology 2016. Tomorrow, the first plenary sessions and symposia will begin, starting with the following subject : “Fundamental muscle biology and neuromuscular junction”, particularly addressing the issue of muscle development (myogenesis) and the involvement of stem cells in this mechanism.